Kristin D. stands in the Bright Spaces room at the Healing Transitions women's campus in Raleigh. Women in the program live on campus for 12 - 18 months and are slowly given greater responsibility, freedom, and trust as they progress through the program. A painting hangs on the wall of the Bright Spaces room, which is used when children visit their mothers, at Healing Transitions in Raleigh. Women in the residential recovery program live on campus for 12 - 18 months. A memorial walkway winds through the garden at the women's campus of Healing Transitions, a residential recovery program, in Raleigh. Women in the program live on campus for 12 - 18 months and are slowly given greater responsibility, freedom, and trust. A memorial brick walkway winds through the garden at the women's campus of Healing Transitions, a residential recovery program, in Raleigh. Notes stating what women in recovery are grateful for hang on a clothesline at Healing Transitions in Raleigh. At various stops, she talked about the Raleigh residential treatment facility, which offers a place for those struggling with substance use disorder and other mental health issues. Healing Transitions has both a men's and a women's campus, and both operate near full capacity for much of the year. Individuals can stay for a year or more as they recover. WUNC is using only Kristin's first name to protect her privacy as she recovers from substance use disorder. As with many people in recovery, this isn’t her first time in the program. She first came through Healing Transition's doors in 2016. "I decided on my own to leave, and I left and went to a couple of sober living houses. And I was successful for a few months, and then I was no longer successful." This second time around, she has been in Healing Transitions almost a year. When women first arrive, they sleep in bunk-beds set up almost like military barracks. As they stay sober for consecutive hours, then days and weeks and months, they progress through the program. In doing so, they gain privileges like privacy. Kristin showed off her room, which she shares with just one other roommate. It includes a private bathroom, a television, and closet space. "This is kind of the goal. This is as best as it gets in this building," she said. "It's pretty awesome. I mean, this is like an apartment, basically. You know, we decorate how we want, we have a little mini fridge." Tracy Freeman leads a class for women in recovery at Healing Transitions in Raleigh. Women in the residential recovery program live on campus for 12 - 18 months and are slowly given greater responsibility, freedom, and trust as they progress through the course of treatment. The goal of the program is to help the women transition successfully back into healthy, productive lives. Patients can stay for free if they can’t afford to pay. Healing Transitions has about a $4 million operating budget and relies on donations and grants, including from the Alcoholic Beverage Control Commission. Mental health care advocates generally agree there aren't enough services for those fighting mental and behavioral health problems, including substance use disorder. In Wake County, there was a sizeable increase of adult hospital inpatient psychiatric bed capacity in 2018. Amanda Blue, director of recovery support services at Healing Transitions, was happy to see that increase. "It's still woefully short, but thank goodness," she said. Still, these new beds are for patients in crisis. Blue praised the work done at the hospitals, but is frustrated at the lack of services beyond those walls. "And then when they're released, we expect them to be fine, never have a recurrence of symptoms, with no follow up and no after care, and that's unrealistic," she said. Amanda Blue, the Director of Recovery Support Services at Healing Transitions, stands in her office at the women's campus in Raleigh. In North Carolina, there are 30 counties without even a single licensed psychologist, according to data from the Cecil G. Sheps Center for Health Services Research, part of the University of North Carolina at Chapel Hill. Statewide, the number of psychologists as a percentage of population has barely budged in the past decade. There were 1.9 psychologists per 10,000 residents in 2001, and that has increased to 2.1 psychologists per 10,000 residents in 2017. But even those figures are misleading as psychologists are so heavily concentrated in Orange and Durham Counties. Just eight counties have more than 3.3 psychologists per 10,000 residents. Moreover, North Carolina could face a massive shortage of psychologists as more hit retirement age. In 2001, only 6 percent of psychologists were age 65 or older, increased to 25 percent in 2017, according to Sheps. At the same time, the state continues to cut funding for these kinds of services. Last year, budget writers slashed $262 million from funding to the mental health management organizations. Brenda Holliman is a registered nurse and licensed therapist and has worked in mental health for years, including part-time at Healing Transitions. She's all too familiar with funding cuts. An Alcoholics Anonymous book sits on the pillow in a woman's bunk bed in the dormitory area of Healing Transitions, a residential recovery program, in Raleigh. "The state funding for mental health keeps getting whacked away so that the services are getting whacked away for the folks that need them the most." The opioid crisis hasn't made as many headlines this year as in recent years. But data for the first half of 2018 show this year could be even worse than last year for hospital emergency departments. "It's the same story of, you know, I had a back injury, I was in a car accident, I hurt my leg playing softball. I got on Percocet, Vicodin, I liked it, got addicted, ran out, had to go, heroin's cheaper," said Holliman. 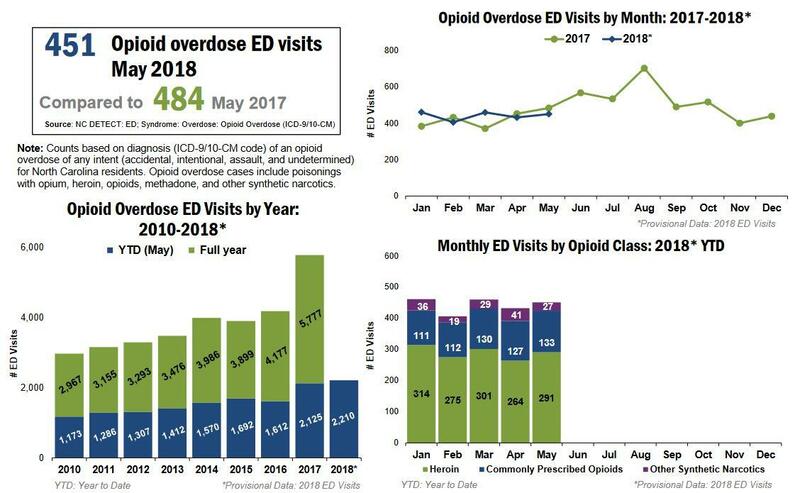 Opioid emergency department stats for North Carolina. At Healing Transitions, as people like Kristin have seen their health improve, it has positively impacted their families as well. Kristin's mother, Laura, now volunteers in the kitchen once a week. "I can put my head on the pillow at night because of Healing Transitions. I know she's safe. And when she, you know, needs help, it's here. When she wants help, it's here," said Laura. Advocates agree the new hospital treatment beds aren't the final solution. But they will help. As North Carolina struggles to climb out of the opioid crisis, facilities like Healing Transitions are ever more important. And they will offer an option to reduce Emergency Department overcrowding, and a place for hurting families. Laura D., right, works as a volunteer in the kitchen at Healing Transitions where her daughter Kristin D., left, is in the recovery program. Kristin has been in the residential recovery program for 13 months. Laura says that "it's because of the program that I can put my head on the pillow at night" since she knows her daughter is in a safe place getting help. Jason deBruyn reports on the uptick in mental health services in Wake County. Veteran Duke basketball fans will remember the name Marty Clark. He played for the Blue Devils in the early 1990s, including on the back-to-back championship teams of 1991 and 1992. But after college, things turned for Clark.